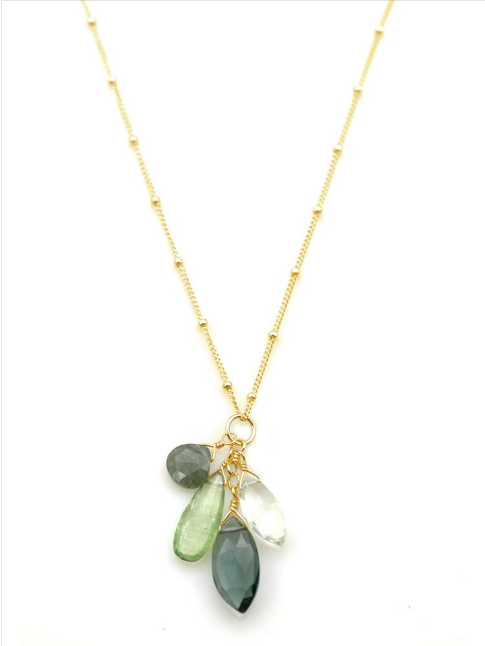 Vermeil (gold over sterling silver) with Kyanite, Moss Aqua, green Amethyst and quartz. The pendant hangs 1 1/2", 16" chain w/2" extender.In 1996 Philippa Roberts established her first studio in the basement of her San Francisco apartment building. What started as a small, hopeful business has developed into a studio attached to her shop in Oakland, CA. class="column2">Philippa’s signature look is simple, organic shapes combined with beautifully cut gemstones. Her love of the ocean plays a large role in the selection of clean, blue and green stones in many of her pieces. Philippa’s creativity stems from the nature around her, yet she also incorporates a feeling of the urban, with lines and patterns that imitate architecture and design seen around the city. Philippa creates all the original pieces by carving in wax or fabricating in metal. Her selection of new stones for each season defines how her collections will come to life. “I love going to the gem shows and being inspired by all the stones I see. To put the colors together and develop a collection is one of my favorite parts of the job.” Once the pieces are ready for production, her team of skilled crafts people make each piece by hand in her Oakland studio.